On July 27, 1847, three horsemen from the scouting party sent out by Brigham Young, obtained an excellent view of the surrounding valley, from the top of this rock. In 1849, Captain Howard Stansbury of the United States Topographical Engineers built a small adobe house by this rock, for his herders, hence the name “Adobe Rock”. The near by highway follows the same route as the old pioneer trail used by explorers, trappers, emigrants and gold seekers.A spring near by made this a favorite camp site. Adobe Rock is a large stone promontory in the northeast corner of Tooele Valley. Early explorers of the Great Basin, California-bound pioneers, and Mormon residents of the valley saw Adobe Rock, a collection of three individual boulders, as a prominent landmark. According to the Daughters of Utah Pioneers historical marker that was placed on the rock in 1947, three men from Brigham Young’s scouting party surveyed the valley from atop the rock. Unfortunately, a written account of this much-referenced incidence is nowhere to be found. However, Mormons weren’t the first to distinguish the rock as a significant spot in the valley’s landscape. Though no written record exists, Goshutes who occupied the Tooele area were well acquainted with the valley’s geologic landmarks. The first Euro-Americans to describe Adobe Rock and the surrounding area were overland migrants who took Hastings Cutoff in 1846 on their way to California. Edwin Bryant, a California immigrant with a book deal to publish his expedition’s journal, recounts that on July 31, 1846 “we passed several remarkable rocks rising in tower-like shapes from the plain, to the height of sixty or eighty feet.” A few short weeks later, Henrich Lienhard, a Swiss emigrant to California, recorded his entrance to the Tooele Valley, camping at a spring that modern historians interpret to be near Adobe Rock. Perhaps the most prolific character to venture near Adobe Rock was U.S. Army Captain Howard Stansbury. 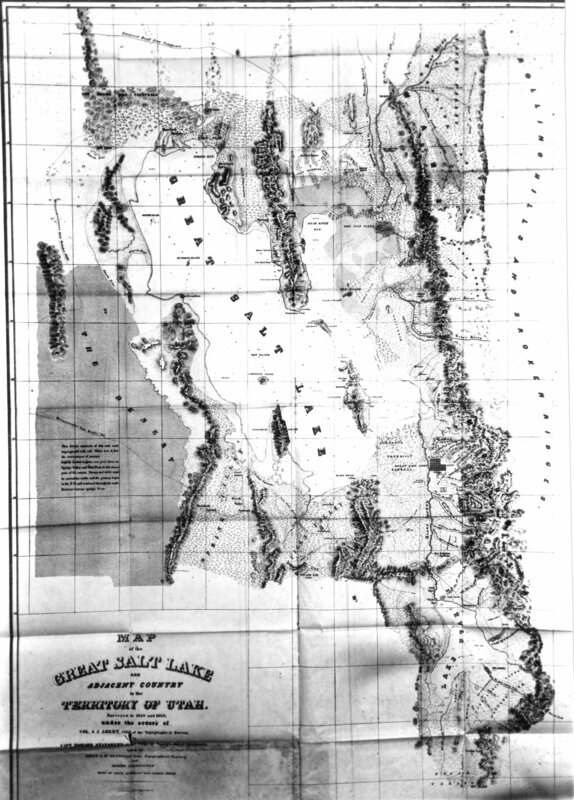 In an 1849 expedition around the Great Salt Lake to study its environs and the geology of the mountains bordering it, Stansbury entered the Tooele Valley from the west, exiting toward Salt Lake to the east near Black Rock. 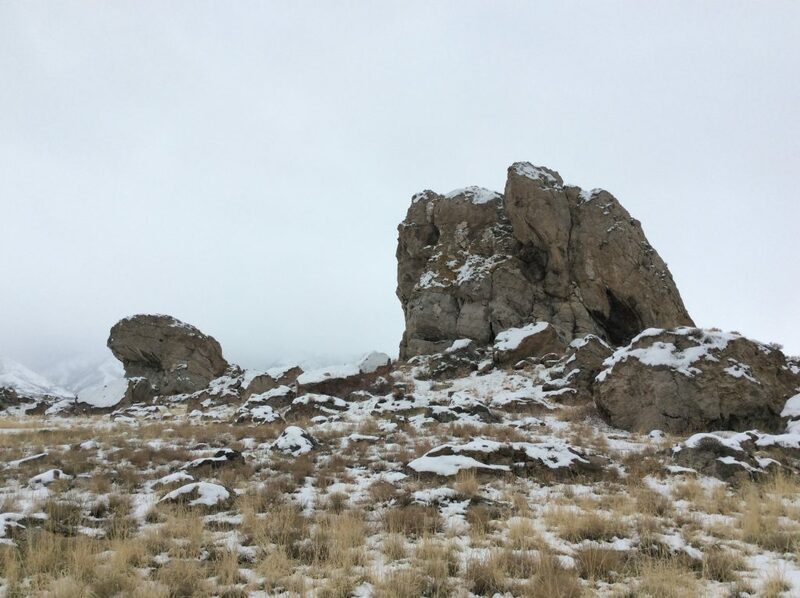 A variety of secondary sources, including the DUP marker on Adobe Rock, reference the construction of an adobe hut near the rock for Stansbury’s herdsman to occupy while wintering cattle in the “Tuilla” Valley. However, in Stansbury’s report, no reference is made to Adobe Rock or the construction of a hut for his herdsman. In fact, Stansbury does not even include Adobe Rock on the map he attaches to his report. References are made to herds wintering in the valley, but there is no specific mention of the adobe hut. Regardless of whether or not reports on the construction of a herdsman hut are accurate, Adobe Rock was a striking feature on the landscape for overland travelers who took Hastings Cutoff, government explorers, and Mormon pioneers. The boulder remains an iconic Tooele County landmark as State Route 36, the main highway to Tooele, passes nearby to the west. 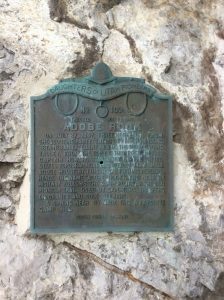 Tooele County Daughters of Utah Pioneers, History of Utah’s Tooele County: From the Edge of the Great Basin Frontier (Tooele, UT: Transcript Bulletin Publishing, 2012), 169-170. Edwin Bryant, “The Journal of Edwin Bryant,” in Utah Historical Quarterly 19 (1951), ed. J. Roderic Korns, 78. Heinrich Lienhard “The Journal of Heinrich Lienhard,” in Utah Historical Quarterly 19 (1951), ed. J. Roderic Korns, 138. Howard Stansbury, Exploration and Survey of the Valley of the Great Salt Lake of Utah, Including a Reconnaissance of a New Route Through the Rocky Mountains (Washington, D.C.: Robert Armstrong, 1853), 117-199, accessed March 29, 2017, https://babel.hathitrust.org/cgi/pt?id=mdp.39015073282918;view=1up;seq=146. Ouida Blanthorn, comp., A History of Tooele County (Salt Lake City: Utah State Historical Society, 1998), 55. DUP, History of Utah’s Tooele County, 161-162. Howard Stansbury, Exploration and Survey of the Valley of the Great Salt Lake of Utah, Including a Reconnaissance of a New Route Through the Rocky Mountains (Philadelphia: Lippincott, Grambo, and Co., 1852), 3, accessed March 29, 2017, https://babel.hathitrust.org/cgi/pt?id=mdp.39015070221182;view=1up;seq=9;size=400. Edwin Bryant, “The Journal of Edwin Bryant,” in Utah Historical Quarterly 19 (1951), ed. J. Roderic Korns. Heinrich Lienhard “The Journal of Heinrich Lienhard,” in Utah Historical Quarterly 19 (1951), ed. J. Roderic Korns. Howard Stansbury, Exploration and Survey of the Valley of the Great Salt Lake of Utah, Including a Reconnaissance of a New Route Through the Rocky Mountains (Washington, D.C.: Robert Armstrong, 1853), accessed March 29, 2017, https://babel.hathitrust.org/cgi/pt?id=mdp.39015073282918;view=1up;seq=146. Howard Stansbury, Exploration and Survey of the Valley of the Great Salt Lake of Utah, Including a Reconnaissance of a New Route Through the Rocky Mountains (Philadelphia: Lippincott, Grambo, and Co., 1852), accessed March 29, 2017, https://babel.hathitrust.org/cgi/pt?id=mdp.39015070221182;view=1up;seq=9;size=400.